Fill out an electronic copyright application using the U.S. Copyright Office's eCO system (see References). Click the "Login to eCO" link and register as a new user. The information requested through the online system is the same as a paper filing. Make sure to list the LLC as the owner of the work if you want the registration to appear in the name of the business and not in the name of an individual. Download Form CO and fill it out on your computer if you don't want to use the eCO system. Form CO is the paper equivalent of the electronic application. It is available on the eCO website in the "Registration with Fill-In Form CO" section (see Resources). The form must be completed on a computer and will print with a series of barcodes that will streamline the processing of the registration. Both eCO and Form CO require a description of the work being registered and when it was first published; the name and address of the author and the copyright claimant; any limit to the registration; the name and address of the people to contact about the copyright or the application; and the signature of the person filing the application, certifying the veracity of the statements made. Call the Copyright Office and request the original forms TX, VA, PA, SR or SE, if you want to use the old copyright applications. 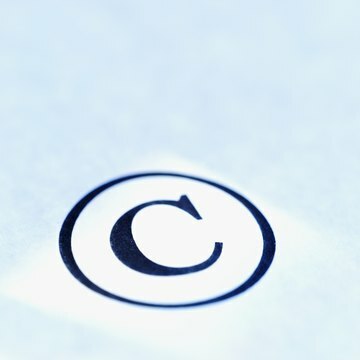 Prior to the adoption of eCO and Form CO, there were five separate copyright applications that corresponded to the type of work being registered. If you have filed copyright applications in the past and would prefer to use the old format, you can still do so. However, the old forms are not available on online. Attach copies of the creative work to the application. You can upload a copy of the work electronically, provided it is in an acceptable file format. If the work cannot be uploaded, the system will print a unique label to use to mail the work to the Copyright Office. The paper applications require a different number of copies, depending on the type of work, but generally, you have to attach two copies of the best published version of the work, or one copy if the work is unpublished. File the application with the Copyright Office with the appropriate filing fee. An eCO filing is less expensive than filing by Form CO, and Form CO is less expensive than using the old forms. The application fee is nonrefundable even if your application is ultimately rejected. The processing time differs depending on which filing method is used; however, eCO allows you to track the status of the application. Once the application is processed, the Copyright Office will mail out a certificate of registration to the address indicated in the application. A copyright is an exclusive right that allows the creator of intellectual property, such as music, to control the use of his work for a certain number of years. You can copyright your music without going through the formal process of registering with the U.S. Copyright Office. Copyright attaches automatically to sheet music or a musical performance you record or produce as soon as it is written, recorded or produced -- all you need to do is write, for example, "Copyright by John Doe 2012 " on work and copyright automatically affixes. However, the professional way to copyright music to best protect your intellectual property rights, is to file it with the Copyright Office. As Circular 56A from the Copyright Office explains, it "must have acted on your application before you can file a suit for copyright infringement." Also, certain remedies, including statutory damages and attorney's fees, can only be awarded if an infringement occurs after the date of registration.